This enlightening book will charm first-time and veteran parents alike. 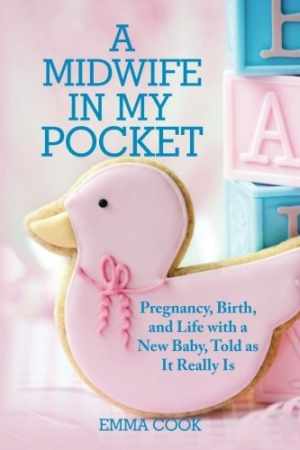 Emma Cook’s A Midwife in My Pocket is a charming and significant resource on what it’s like to have a baby. Cook incorporates her professional experience into a helpful and personable guide to the medical side of pregnancy and childbirth. Cook, a midwife and a mother herself, gives illuminating and detailed tips on everything from the sensations of childbirth, to the pros and cons of certain pain relievers, to the importance of skin-to-skin contact with newborns. The genuine joy in her narrative for helping new parents know what to expect, and for dispelling myths about childbirth, is palpable, and makes this book not just informative, but engaging. Delightful British-isms and a candid nature keep the work fresh. It enthusiastically and encouragingly recommends that new mothers “do a wee” after the birth, and “then you can have the best cup of tea and slice of toast in the world!” It truly gives the fairytale-like impression that a peppy British midwife has stepped in to save the day. Some phrases may be unclear for new parents, such as “gro-bag” and “Moses basket,” though they are referred to as though they were common knowledge. While the commitment to providing up-to-date information on the topic is commendable, occasional statements vaguely refer to recent news reports and lack specificity. Some statements are overly general, like “avoid herbal remedies,” and could be confusing. The format of the book is a bit busy. It often overuses italics, bolding, capitalization, and a multitude of supposed side notes called “Top Tips.” The result is that nothing in particular stands out; too much is emphasized and topics feel scattered. This book is an asset for its recognition that, while family members can give helpful advice on childbirth and pregnancy, some common adages are outdated and even harmful. For example, while a few decades ago bumpers were unquestionably sold as part of a baby’s bedding set, this book details how such materials can cause Sudden Infant Death Syndrome (SIDS). One of the most useful sections is on the actual sensations of childbirth. It is clear that the author has firsthand authority to speak on the matter, and she gives a thorough play-by-play of what is normal, as well as presenting different scenarios that could occur with a sage reassurance. Childbirth is so frequently portrayed in media that some myths—that the only option for pain relief is an epidural, for instance—are persistent. By providing information on the variety of options during the process and explaining in detail the benefits and risks of each, this book proves to be an invaluable resource.